Ames, Iowa band Mumford's performs at KRUI. One of my favorite Iowan bands has to be the Ames, Iowa collective Mumford’s. In 2010, they played live on my radio show, and I have been smitten ever since. Under the careful leadership of guitarist/vocalist/trumpet player Nate Logsdon, the group creates songs that are simultaneously tragic and comedic. 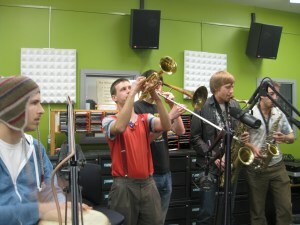 The horn/folk/dance band members embody the “do-it-yourself, do-it-all” spirit of college radio, running their own Maximum Ames Music Festival, The Space For Ames venue, and the Ames Progressive news blog. Mumford’s music explores a variety of religious themes while weaving narratives that always end in the discovery of a beautiful, new light.